Yesterday I was contacted about a possible albino hummingbird that had been photographed coming to feeders in the Salida, CO area. I believe this bird meets criteria for full albino rather than leucistic because it has very white feathering (rather than off-white or a pinkish bill and feet and reddish eyes. I cropped these photos taken by Judith Anne Smith and did not modify the coloration. True Albino hummingbirds are very rare as are leucistic hummingbirds, just more so. 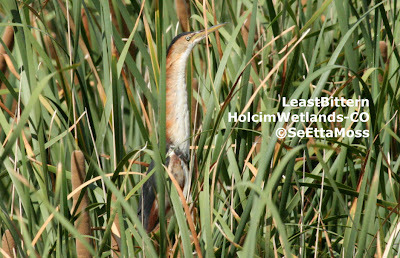 Shortly after I watched a fledgling (or two) practice clinging to a cattail and looking around (possibly to see what caused all the noise and vibration--a local rock quarry train had pulled up and stopped on tracks about a hundred feet from the birds), I spotted this Least Bittern which I believe due to it's darker plumage is the male. 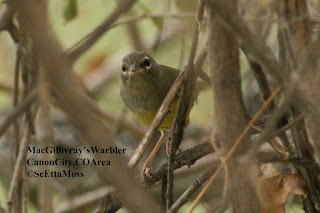 Least Bitterns near Canon City, CO: fledglings! 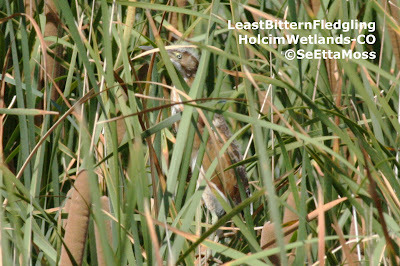 Due to post surgery restrictions I haven't been able to get out to the Holcim Wetlands where the Least Bittern was found 2 weeks ago. 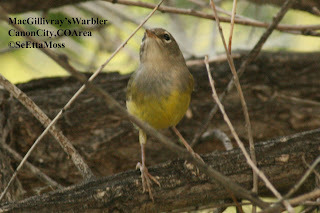 Since then other birders have seen possible male and female birds raising the possibility that there might be breeding occurring. I went out this morning and looked for them from 7 am to 11 am--I could hear Least Bittern soft 'cooing' calls off and on but could not spot any birds. Interestingly, the location the calls were coming from was right where I had photographed the Least Bittern the first time as it hunted. When I left I stopped for some food in nearby Florence and checked my email on my Droid phone--a post this morning while I was at Holcim stating he had seen a male, a female and 2-3 fledglings yesterday between noon and 1pm. So I gobbled down my food and returned to Holcim Wetlands to try again, at this unusual mid-day time frame. 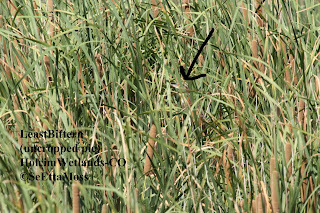 Shorebird survives flight through Hurricane Irene! While birds and other wildlife have evolved over thousands of years with hurricanes and other severe weather events, they are still subject to their impacts. In a blog entry titled "Seven Things to Know About How Hurricanes Affect Wildlife" by Kevin Coyle on the National Wildlife Federation 'Wildlife Promise' blog site, a story is recounted about a Brown Pelican (like the bird above that I photographed this past January) that was reported in the news media as having been blown very far off course to Nova Scotia during Hurricane Earl. Mr. Coyle goes on to discuss how perching birds cling with their toes wrapped around branches, an adaptation that keeps them safely perched in trees while they sleep also. Various other species of birds have evolved different strategies to help them cope with hurricanes. Other species are also affected and this blog notes that "some dolphins and manatees have actually been blown ashore during major storms."